Did you know that it is possible to find animal paws in the ocean? That’s right, two different shells are named after the paws of animals. Both are a form of scallop shell. The first one we will talk about is exceptionally large for a scallop. It has all the right stuff to be a beachcomber’s dream find. The coveted lion’s paw shell can be up to 6 inches tall, but sadly it is rarely found in really good condition. 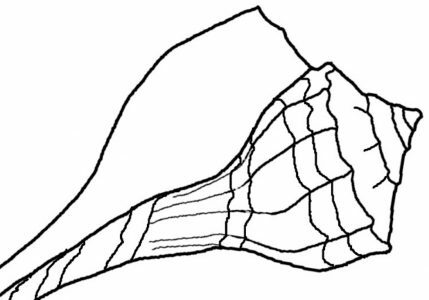 The Lion’s Paw seashell (Nodipecten nodosus) has distinct large ridges that make a bumpy fan shape, and the color of the shell is usually dark orange or dull red, but sometimes it will appear purple or a duller pale color. The kittenspaw seashell is much easier to find and it is pretty small – only an inch or two wide. I personally have found a few of those (my picture below), but I have never found a Lion’s Paw shell. Hello, thank you for your insight. I was wondering if you could help me identify some sea shells? Thank you. I use books to help me identify seashells. You could probably do the same thing. Since there are so many varieties, just knowing the basics may help you find yours. That is what I try to do with my blog.